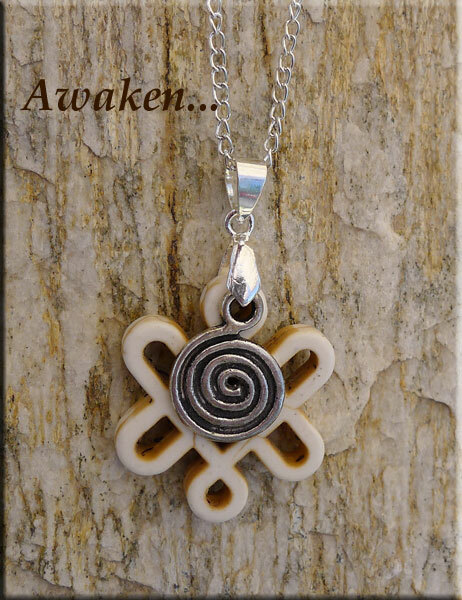 Magnesite resonates with the Heart, 3rd Eye and Crown Chakras. It is a calming stone that assists the state of no mind during meditation. Magnesite is sometimes used to stimulates psychic visioning, allowing the free flow of creative ideas and practical application. Spirals are some of the oldest geometric shapes in ancient artwork. The spiral symbol often represents the path leading from outer consciousness (ego) to the inner soul (enlightenment). The Witch's Knot is a common symbol in folk magic. In its many variations, the knot has become a symbol of protection against malevolence. Witches use knotted cords to create circles of protection, and to bind things magically. Just as magic knots are used to bind things, so they are also used to release things, in general things that are within a witches' power to release. Knots are also used to contain power -- In order to possess that power one had to untie the knot. Overall Pendant Measurements : 40mm (just a smidge over 1-1/2") long x 24mm (just under 1") wide. The Bail has an ~4.5x3mm opening. The charm is Tibetan Silver (the fancy name for Lead-safe Pewter). The other metals are silver-plated brass. Sorry, necklace chain is not included.